Compared to younger adults whose main goal is often keeping their weight down, many seniors need to keep their weight up. With age, muscle mass naturally decreases, and appetite reduces, putting older adults at risk of being underweight. Limited mobility, social isolation and low mood are other reasons elders unintentionally lose weight. It's crucial for a family doctor to evaluate cases of sudden, unexplained weight loss to rule out potentially serious underlying conditions. 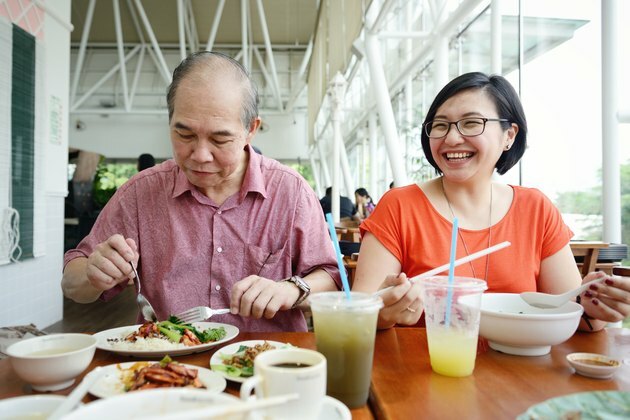 Seniors can get help from a physician or clinical dietitian to devise a weight-gaining plan to avoid the negative health implications of being underweight. A good way to increase weight in seniors is through calorie-dense foods. Because of reduced appetite and other factors, it's often difficult for older adults to eat a larger volume of food. By choosing foods with a higher calorie-to-volume ratio, seniors can significantly boost calorie intake without having to eat more. Nuts and nut butters, avocados, seeds, dried fruit, coconut-based foods, whole grains and full-fat dairy are nutritious calorie-dense options that add more calories to a senior's diet. These foods are also rich in crucial nutrients for senior health, such as calcium, magnesium and potassium. Try adding 2 tablespoons of nut butter to fruit slices, smoothies, whole-grain bread and celery stalks to increase the content of a meal or snack by close to 200 calories. Boost the calorie content of a salad by 234 calories with a cup of sliced avocado. Making simple changes like these several times a day can make a big difference in a senior's calorie intake. Try five or six small meals, instead of the conventional three, as an easier way to boost calorie intake. Make sure to spread meals out evenly throughout the day and break them up into main meals as well as nutritious snacks in between. A good tip is to cook foods longer so that they are more tender and easier to eat for older adults who have dental issues. Incorporate soft, easy-to-prepare foods that can boost calorie intake. Yogurt made from whole milk makes a good snack. Fresh fruit smoothies with coconut milk and a tablespoon of peanut butter, cream-based soups, cooked cereals with milk, and fruit with full fat cheese are good options, too. Drizzle olive oil over potatoes, rice or cooked vegetables to add flavor and boost calories. Plan meals that are easy to prepare or reheat from fresh whole foods. Staples such as brown rice, beans and other legumes are easy to make in large batches. Try cooking several servings at a time and storing them so seniors can whip up a meal in a matter of minutes. If possible, plan and prepare weekly meals ahead of time so seniors don't have to agonize over what to eat. An example of a high-calorie breakfast is 3 ounces of granola with an ounce of chopped pecans and a handful of blueberries mixed with 1/2 cup of whole milk yogurt. Full-fat yogurt is higher in protein and lower in sugar than fat-free yogurt, making it a good option for seniors needing to put on a few pounds. Calorie-dense food such as pasta makes a good lunch option. Pasta stores well, is easy to prepare, and tastes good cold or hot. Try penne pasta with grilled chicken, plum tomatoes and feta cheese tossed in a vinaigrette. Add starchy foods such as white potatoes, rice or bread to dinner to up the calorie count. For example, serve meat loaf with a baked potato and a slice of garlic bread. When seniors are having trouble getting enough calories each day, nutritional supplements may be beneficial. These are available over-the-counter as ready-to-drink beverages or powders. They're fortified with vitamins and minerals and can contain 190 to 240 calories per serving. Drinking nutritional supplements between meals is an easy way to boost daily calorie intake. However, some nutritional drinks for seniors contain excess sugars, so be sure to read labels carefully. Alternatively, it's easy to make homemade shakes by mixing powdered milk with whole milk or coconut milk and a banana or other fruit. You can also add powdered milk to soups, pudding and other foods with a liquid texture. Choose nutritional supplements that have a balanced amount of protein -- 8 to 10 grams is a good target per serving. The current recommended daily intake of 0.8 grams of protein per kilogram of body weight is the same for all adults; however, older adults need more protein than their younger counterparts. Seniors need at least 1 gram per kilogram of body weight, according to an article the Geriatric Research Education and Clinical Center published in the Journal of the American College of Nutrition in 2004. When making a homemade nutritional supplement, incorporate protein such as yogurt, whole milk and nuts. Some seniors may have special dietary needs such as restricted protein stemming from kidney disease, so, if this is the case, choose a low-protein supplement. It's crucial to tailor the nutritional supplement based on individual needs. Regular exercise helps put on weight through increasing muscle mass in seniors, and getting moving helps boost appetite. Walking is one of the best physical activities for elders as it's easy on the joints. Staying active also helps stave off disease and improve health for seniors living with chronic health conditions. Make sure the doctor gives the OK before beginning any exercise, though. Minimize psychological barriers to eating, such as social isolation. Encourage seniors to eat meals with family or join neighborhood community centers so they can enjoy meals with others. For seniors who have limited mobility and have trouble getting to the grocery store, arrange to have meals delivered. Government and private programs are available in each state that deliver healthy meals to seniors. Harvard Health Publications: Supplemental Nutrition Drinks: Help or Hype? What Weight Gain Drink Is Good to Gain Weight in Elderly People?